Every image belongs to someone - it is someone's copyright. Thus it is with images, even on the Internet, even though this is ignored by millions on a regular basis. Be aware of who owns the picture, at the very least. Ask their permission, read the small print, there are all different kinds of usage restrictions with different names. As a web publisher, you ARE a web publisher and responsible for the content on your site. Now, there are free images that you can use. Search for "free images" and check the copyright stipulation. If you are a professional in any field seeking customers who will pay you money for your services, you are not a "personal and private usage" any longer, you are "commercial". A lot of people do not know that you can't just copy the URL of an existing image and paste it in your webpage. This is called "hotlinking" and another term is "stealing bandwidth" because the person on whose servers the image is hosted has to pay for every time YOUR site visitors load up YOUR page. They get nothing out of it, and therefore it is completely illegal as well as highly frowned upon. Tip 3: Download images to your own computer, then upload them again, using the image uploader in articles, and in blocks. 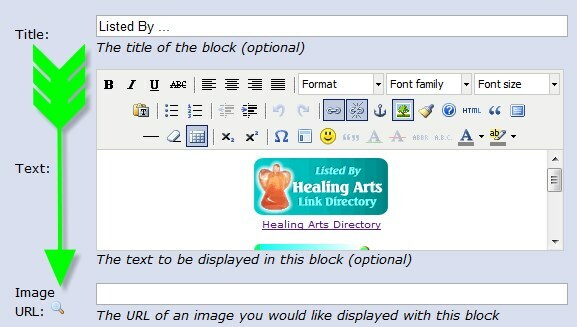 In this example, the image uploader was used to put a picture *inside* the block, to be able to put a hyperlink on it. Tip 3a: If your image uploader doesn't seem to "do anything" try a different browser. Now we have to mention image size. For a block or an article, the image is re-sized to 132x132 pixels. It really shouldnt be any larger than 50kb, preferably much smaller than that, between 10 and 25 KB as these articles images also get passed around the network to show on RSS feeds. The image uploader shows you how big the image is. If you see more than 50kb there, STOP and re-size the picture first! Tip 3b: There are online image re-sizers available you can use for free if you don't have an art program to do it for you. http://www.online-image-editor.com/ is one of many examples. It's easy. Now we're getting there - proper sized images that are usage legal and link legal to go with your articles! Yay! Here is another helpful tip. Tip 4: If you want to put a bigger picture *inside* an article, you can use the image uploader to upload the image, then you can copy and paste the image URL from the image uploader box and transfer it via the little tree icon which means insert picture into your article's page. You can upload as many pictures as you want, but once again, keep them to a reasonable size. Anything over 200KB isn't that user-friendly for internet usage. And here's the final tip. Tip 5: When you save images to your own computer first, re-name them to something that makes sense and matches your article content. So instead of 564783920fhjdks7e89w0.gif the image name supports what's going on in the article. Ie for an article about ships, re-name the image of sailing ships to "sailing-ships.jpg" before saving them. Hope this has been useful; enjoy your article's images and your noding!